This display was last shown on February 3, 2001. 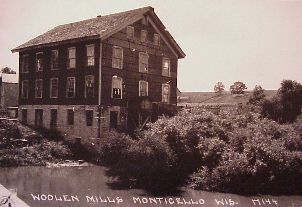 Monticello Woolen Mill, died in 1998 at the age of 92. In 1950 a fire destroyed the Monticello landmark which had stood for 84 years and which had produced many hundreds of thousands of the high quality widely known Monticello blankets. The Monticello Woolen Mill was built by a stock company in 1866. The plant was operated by the stock company until 1890, when it was purchased by D. Kennedy, who learned the art of weaving in his native Ireland. With his sons, Charles D., and Thomas, he operated a thriving business until 1921. His sons continued to operate the mill for many years. In 1942 Howard D. Kennedy, a grandson, acquired the mill and became the third generation of the family to own it. The mill was the source of employment for up to eight or ten people during the peak of the season ever since it was founded, and was one of the few places in Monticello which gave employment. 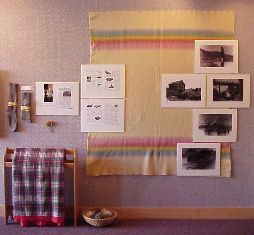 The mill was engaged principally in custom work and manufactured blankets for customers from all over the United States. Among others it supplied Carson Pirie Scott and Marshall Fields. In addition to regular blankets, the Kennedys also manufactured auto robes and woolen socks. 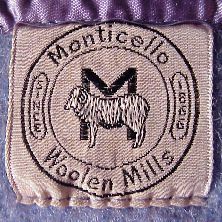 Some of the machinery in the plant dated back before the 1900's, but the quality of the Monticello Woolen Mill products was extremely high and compared with the best. flume caused the wheel to turn and the machinery was operated by this means. One Monticello resident remembers that her grandfather brought wool to the mill and stabled his horses and stayed overnight in Monticello before his return home from the lengthy journey. The blankets, robes, socks and yarn on display were all made by the Monticello Woolen Mill. Many of these items display their original labels. The photographs in the exhibit show the mill building, picker house, wooden bridge, metal bridge, Little Sugar river, dam, flume, and a train under the woolen mill bridge. Keunwoo Chung, a student in landscape architecture at the University of Wisconsin - Madison, as his senior thesis project. (608) 263-4420 (W) or (608) 274-2959 (H). Monticello Area Historical Society President.